If you are a fan of Maira Kalman as I am, and you’re anywhere near San Francisco, this show is a must see! It’s the first museum survey of her narrative art and it is absolutely wonderful. If you can’t get there, visit the museum’s website and click on the images on the upper right of that page to see bigger pictures of some of the treasures in the show. 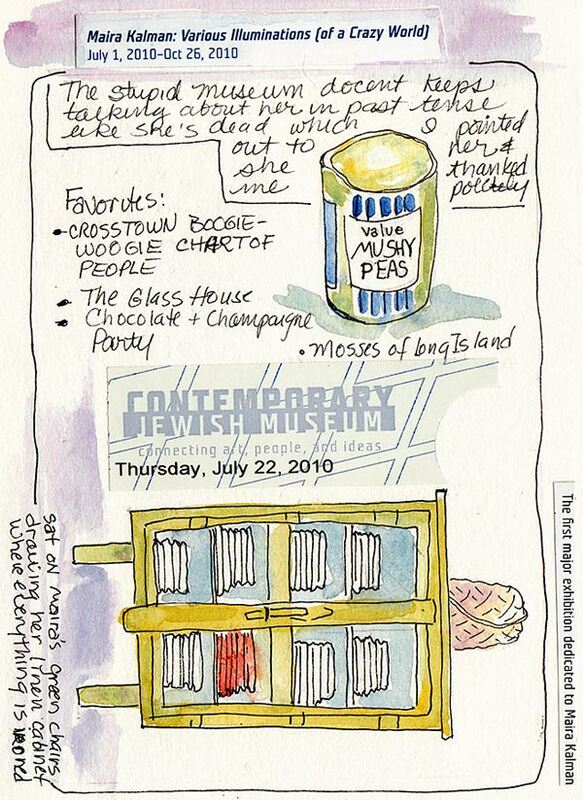 The show includes many of her paintings and some of her collections of oddities like an onion ring collection (yes, literally), a box of small envelopes labeled “The Mosses of Long Island,” and other assorted items including the can of “Mushy Peas” in my sketch below. I did a couple of sketches at the show and took a few notes (above). The well-meaning docent leading a group kept referring to Maira in the past tense as if she were dead. It was driving me crazy so as soon as she finished I pointed it out, mentioning that Maira was very much alive. She thanked me and said she hadn’t realized she’d been doing that. And of course that she knew Maira was alive, as she’d been there for the opening. You can find out more about Maira Kalman on her website here or on her amazing New York Times illustrated blogs here and here. I also wrote about her process of adding words to her paintings on my blog here (she adds them on a separate transparent sheet, not on the artwork). I love Maira too! Your sketches of the show are wonderful, and I especially like how you wrote “…her linen cabinet where everything is ironed”. It actually sounded like something she would say! Thanks for this Jana – I don’t know her work, but it looks wonderful. I wish I could come to SF right now (and have lunch with you!) but Il go to the website instead. Catesa: Thanks! I really recommend going to Japan. It really is fantastic!